Zymox Topical Cream provides a powerful natural enzyme formula to aid in the treatment of skin infections. The enzymes have been shown to have natural antimicrobial properties and when combined produce a powerful defense system. It is used for topical infections, wounds and cuts. It aids in the treatment of infections due to bacteria, fungus and viruses. With products containing hydrocortisone, do not use on pregnant or lactating females. Avoid contact with eyes. Stop use and consult your veterinarian if condition worsens, or rash or other allergic reaction develops. Keep out of reach of children. Store at room temperature. Inactive Ingredients: Aloe Vera, Benzyl Alcohol, Dextrose, Glucose Oxidase, Glycerin, Glyceryl Polymethacrylate, Isopropyl Myristate, Lactoferrin, Lactoperoxidase, Lysozyme, Potassium Iodide, Propylene Glycol, Purified Water, Titanium Dioxide, Zinc Gluconate. Apply Topical Cream to affected area once daily or as needed for one to two weeks. Apply until area is completely healed. May be lightly covered with a sterile bandage. ZYMOX empowers pet parents with patented formulations of natural enzymes to help treat chronic infections in dogs, cats and horses. Their products are also formulated to be safe to use on kittens, puppies and even senior dogs. These solutions pack a potent antiseptic punch that targets the source of infections—bacteria, fungi and yeasts—to provide therapeutic relief, care, protection and prevention, without any antibiotics or harsh chemicals. 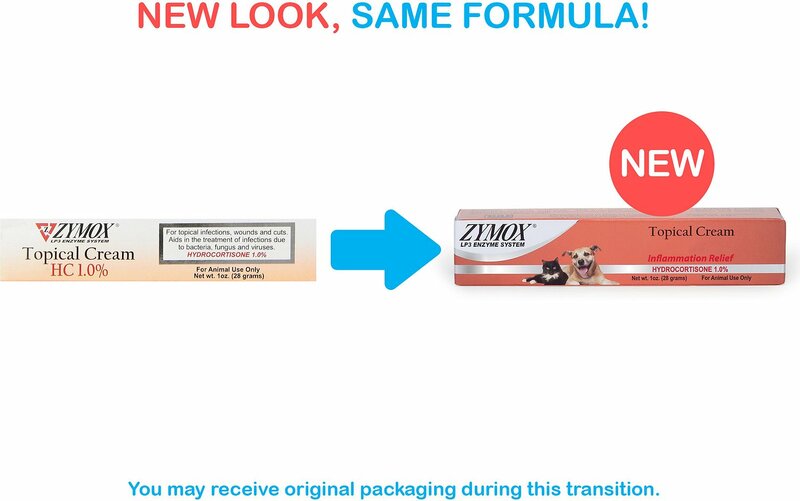 To ensure overall health from snout to tail on all four-legged pals, Zymox has developed products that are specially formulated for all the areas that commonly need infection relief, like the ears, teeth and gums, and skin and coat. To keep furry ones happy, their products treat ear infections, skin allergies, hot spots, bad breath, gum disease and more. Ear Care Solutions: Effective, non-toxic solutions with special enzymes and mild cleansers to keep ears clean and fresh, and combat microbes that can cause ear infections. Oral Care Solutions: Brushless solutions with unique enzymes to dissolve plaque and prevent its buildup, boost natural "good bacteria," and protect against gum disease to keep kitty and doggy smiles healthy. Skin and Coat Health: Topical sprays and shampoos for dogs, cats and horses that form a powerful protective barrier against minor skin inflammations from bacteria and fungi, while cleaning and conditioning the coat—with some formulas utilizing hydrocortisone. Because Zymox formulas are made with 100% naturally derived enzymes from dairy, they are safe for anytime use, both for immediate soothing relief and to prevent infections. The powerful enzymes work to eliminate problem single-celled organisms such as bacteria, fungi and yeast, while leaving healthy cells untouched. This means no irritations for your pal! Zymox products use a patented, gentle formulation that combines three potent, naturally occurring enzymes—lactoperoxidase, lysozyme and lactoferrin—that are sourced from milk products. These enzymes are proven to work together to eliminate the source of infection on your pet, without any toxins or antibiotics that can irritate or cause antibiotic resistance. Zymox was founded in 1998 by Pamela Bosco, who sought to change the way that people treated and managed ear, oral and skin infections with a safer alternative to antibiotics. Enlisting the help of her brother—a scientist that developed the enzyme technology in Biotene—Bosco formulated a powerful enzyme-based solution to help treat infections in dogs, cats and horses with no toxins, chemicals or antibiotics. Committed to keeping all four-legged pals healthy, they offer USA-made and sourced products to treat, soothe and protect against bacterial and fungal infections gently and 100% naturally. I used the product for a year. It helped me maintain some healing for my dog's hot spot on his leg. But I came to realize that he needed an E-collar. I resisted putting the cone on but I found a nice soft one. Without a barrier an animal won't leave it on long enough to work. Now he can have the benefit of the cream, the antibiotics, and a little exercise to keep the blood flow to the foot. Seems to be doing well. Every few months, my cat Joey was scratching his pointy ears until the skin broke in places. The vet could not determine why. I have been applying this lotion once per week -- I rub a small amount into the entire ear surface--inside and outside. Like a moisturizer. Joey doesn't seem to mind. No more scratching. No more red areas of broken skin. My dog had an itchy rash, sort of like a hot spot. Instead of going to the vet I ordered the Zymox and it has been working. The rash is almost gone now. It is important to clean and dry the are before applying the cream. My dog suffers from allergies and would scratch herself really bad. Once I apply this cream it healed right away. A must buy. This works for the hot spots on one of our dogs. It doesn't take much, its clear but thick and we only use it when necessary. Wouldn't use it on an area the animal could lick the product. My dog Dakota has terrible allergies. This is the only product that gives her any relief when she gets hot spots. It works fast and greatly reduces the inflammation. My Havanese pup has had skin issues for years. He looked like a plucked chicken! I spent a fortune in vet bills and over the counter remedies. This Zymox Topical Cream is short of a miracle cure for my Petey. He is no longer red and rashy and miserable. His skin is a light pink now and he is even starting to grow hair. I will definitely keep this product on hand at all times. I use this for almost anything and it is great. Stops itching and very easy to apply. My little girl does not lick it.